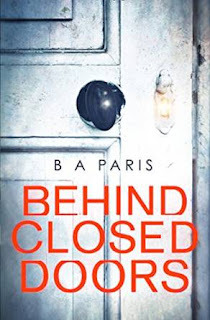 BleachHouseLibrary.ie: Book Review - Behind Closed Doors by B.A. Paris. Pub 11 Feb 2016. Book Review - Behind Closed Doors by B.A. Paris. Pub 11 Feb 2016. The Perfect Couple. We all know one, right? The beautiful, adoring wife. The handsome and successful husband. A home straight from the pages of a magazine. A life we are supposed to aspire to. But, sometimes there is just something not quite right with the picture. An uneasy feeling perhaps? A random stray thought entering our minds? What is it really like behind their closed doors? Is it all rosy in the garden or are there shades of grey mixed in with all the light beaming down from their happiness? Jack and Grace are one such perfect couple. He, a prominent lawyer, is a voice for victims of domestic abuse and an enigmatic, charismatic addition to any party. She, a stay at home wife, is the epitome of elegance, always immaculately turned out, standing proudly at her husbands side. Although they have no children they plan on becoming full-time guardians of Grace's sister, Millie, who lives in a care facility. The family will be complete and their perfect life can only get better. Or can it? One new member of their social circle has noticed that she can never seem to get Grace alone and she senses a tense undercurrent in the air. Grace may appear to have it all, but something just doesn't seem right. The doors to their beautiful home are firmly shut and their lives shrouded in abstract glory. How long before someone cracks through the facade?